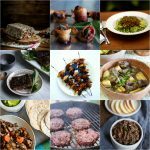 All of the healing diets featured on this website emphasize the importance of organ meats, because they are the most nutrient-dense foods we can eat. This is the first installment in my “organ love” series, where I intend to show that these meats can be as delicious as they are nutritious. Expect more recipes throughout the year, but today I'm starting with the heart, because its taste and texture is very similar to steak. A huge dose of B Vitamins: 161% of your daily need for B12, 60% of your daily need for Riboflavin, 43% of your daily need for niacin, and substantial amounts of thiamin and B6 as well. These B Vitamins support our mental health – everything from relieving anxiety and depression, to balancing moods, to boosting memory and energy levels. A common symptom of autoimmune disease is “brain fog.” B vitamins are excellent at dispersing the mists. Many important minerals: iron, magnesium, phosphorous, potassium, zinc, and selenium. We don't often focus on minerals, but check out what they do for us: Iron is needed to form red blood cells and transport oxygen throughout the body. Magnesium regulates blood sugar, maintains normal nerve function, keeps our heartbeat rhythmic and supports a healthy immune system. Phosphorous provides strength for our bones and teeth. Potassium is required for keeping our organs and muscles in good shape. Zinc assists in hundreds of body processes, from producing DNA, to repairing cells, to helping us sleep at night. And Selenium is an essential synergist, that helps the other antioxidants in our bodies do their jobs. 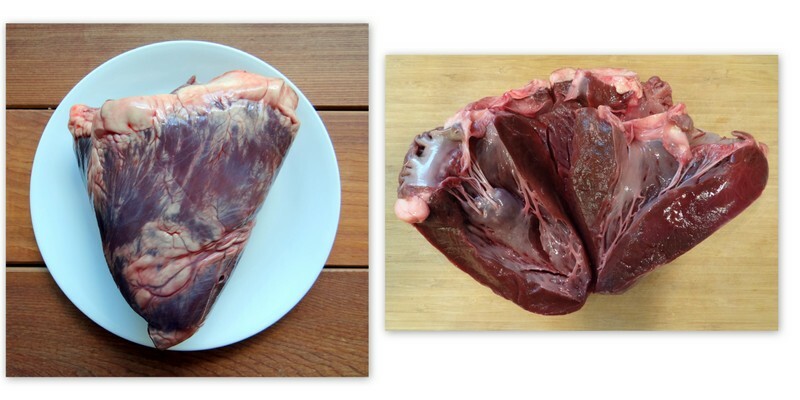 Beef heart looks like a heart, and in this age of packaged meats, we are rarely forced to face the reality of where our meat originates. However, I think it's better when we are forced to be conscious, because we're then more likely to care about the humane treatment of domestic animals, and be grateful for the food they provide. 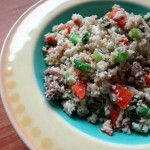 This recipe doesn't allow you to take meat for granted. Eating organ meat is also the most sustainable way to eat meat, because it honors the whole animal, without throwing valuable cuts away. In the picture above on the left, you can see there's kind of a white sheen on the surface of the meat. This is fascia designed to protect the heart. It's really tough and needs to be removed. Get a sharp knife ready. In the picture above on the right, you can see the valves that are also tough and need to be removed. A beef heart usually weighs around 4 pounds. Expect to lose 1-2 pounds in the trimming. The good news is that heart meat is very inexpensive. Sometimes, it's even given away for free. The video below is done by Chef Chris Cosentino and shows you how to cut the heart into useable portions. If you think you'll be preparing heart regularly, it's worth buying a semi-stiff boning knife. it makes the prep much easier, and you lose less meat. One note on the video: he's a professional chef, so be careful with your knife at home, and if the thin section of the heart is too difficult to trim, feel free to only use the thicker pieces. 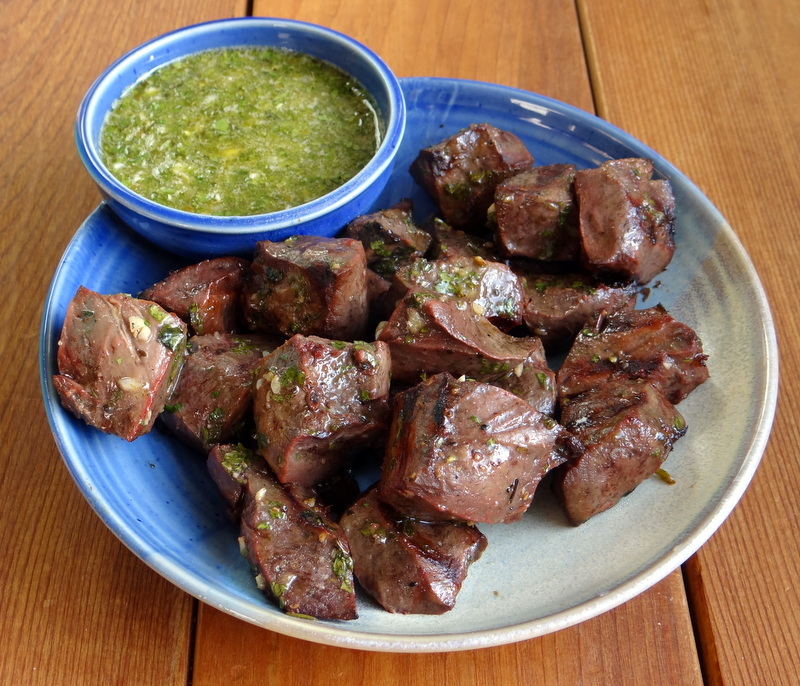 Once done, you can cut the trimmed heart meat into cubes and put it in stew, or grind it into hamburgers, or follow my favorite recipe below which flavors the meat with chimichurri sauce. Local Harvest is a website that connects consumers with local farmers. They are great sources for organ meat, often at the lowest prices. 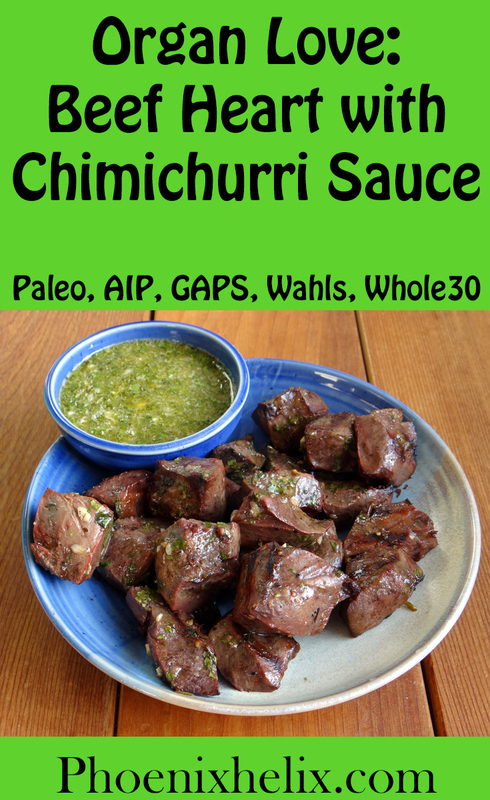 US Wellness is an online meat provider that's a favorite in the paleo community. They sell a wide variety of grass-fed organ meats, including beef heart, beef liver, beef kidney, beef sweetbreads, beef organ sausages, chicken livers, chicken hearts, bison liver, lamb heart, lamb kidney, lamb liver, and lamb sweetbreads. Cut the fat, vessels and fascial layer off the beef heart & throw them away. (See video above for demonstration). Cut remaining heart meat into kebab sized cubes. Put the heart cubes in small casserole dish. Sprinkle liberally with salt (and pepper if using) . Put the herbs, garlic and shallots in a food processor, along with ¼ cup olive oil. Pulse to blend. Pour 1 cup of the sauce into a glass measuring cup and put in the fridge until later. Pour the remaining sauce over the heart cubes and toss to blend. Marinate in the fridge a minimum of 2 hours and up to 24 hours. I did 8 hours, and it was delicious. Remove reserved sauce from the fridge, to allow it to come to room temperature. Stir with a fork to blend, before serving. 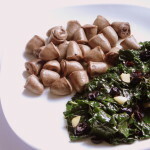 Cook the heart cubes 4 minutes per side and serve with small bowl of fresh sauce for dipping. Note: If you have leftovers, the heart cubes taste really good cold.